Spirit is a one-stop shop with an easy-to-use interface. Well-organized and with plenty of videos and costume idea resources, Spirit's strengths are in its variety (four pages of pirate costumes) and ease of use. Returns are free. Halloween Express is your one-stop Halloween shop. They have everything you need for the spookiest 31st ever, with free exchanges and free same-day shipping to get you your treats in no time. They also provide live chat help, 24 hours a day, 7 days a week. Frank Bee Costumes offers one of the largest, if not the largest, collection of costumes around. Their massive inventory includes the newest and most popular brands and characters, which makes finding the perfect costume for yourself or for your children incredibly easy. Looking for Halloween costumes for the whole family without having to break the bank? Then you should definitely give Pure Costumes a good look. They are currently offering free shipping on orders over $65, and you can receive $5 off an order of $50 or more by using the code FIVEOFF. Sign up for their newsletter, and you'll receive 15% off your first order. Any costume, any time is certainly true of Anytime Costumes, which houses lots of promotions and a gigantic variety of inventory. They've also got free exchanges and in-home delivery date guarantees. Get 15% off orders $50+ with code TREAT15! "Thousands of Costumes. Millions of smiles." The motto of Costume Craze certainly rings true, as they have a gigantic inventory of costumes, accessories, and props for everyone! Most costumes have costumer reviews for added information before you buy. As their name may imply, Official Costumes is one of the best places to look for authentic, officially licensed costumes for Halloween for both kids and adults. From Star Wars to Disney to DC Comics, your favorite brands and characters can almost certainly be found here. You'll find everything you need at Costume Discounters, and they'll match any price you find for an identical costume on the web. Plus, Costume Discounters has many expedited delivery options, promotions, and sales and includes pet costumes in their already extensive line of inventory. Use coupon code 15CD50 to get 15% off $50 or more! Costume Supercenter offers free exchanges, free shipping, and lots of sales items ensure you're getting the best price for the costume or accessory of your choice. Browsing for the perfect getup? The site has over 20,000 to choose from and the prices are hard to beat. Get 15% off costumes priced $20 or more with code X15! 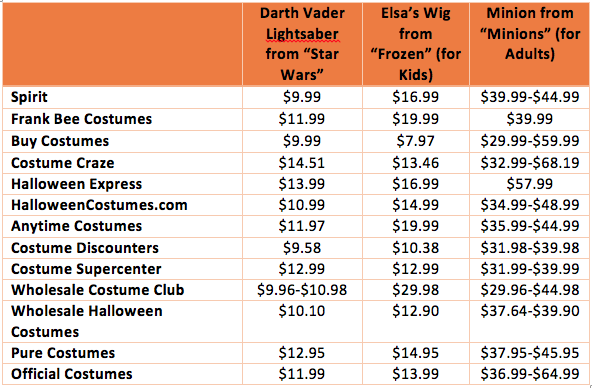 Low, low prices make Wholesale Costume Club a steal. Membership at $5 a year yields even deeper discounts on already discounted merchandise with really low, fixed shipping rates. Wholesale Halloween Costumes not only has a wide array of costumes, makeup, hats, masks and wigs, but it also has party supplies, props, and decorations to make any holiday experience complete. Packed with exclusive buys, Buy Costumes has costumes for men, women, groups, teens, pets, and accessories for everyone…PLUS great deals on party supplies, favors, candy, and kits. Not only does HalloweenCostumes.com offer an incredibly vast collection of costumes and accessories, they also ship to over 200 countries around the world, and they offer same-day shipping for most orders that are placed before 12PM CST on the weekdays. What's your favorite source for halloween costumes? some of these sites have cash back deals with ebates. It might only be a few bucks but if you shop online a lot it can add up over the quarter.